This very popular chutney is the perfect accompaniment to a cheese ploughman’s and is ideal with pork or cold ham. The cider used to create this apple chutney comes from Cornish Orchards, based near Liskeard. Cornish Orchards produce premium award winning ciders from a perfect blend of sweet and dessert apples. 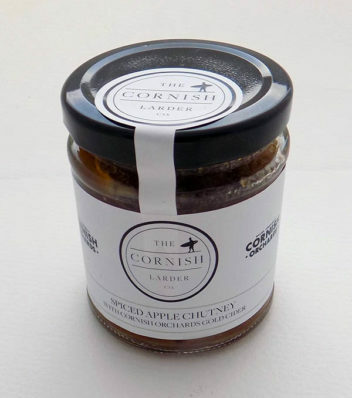 With a large glug of Cornish Gold cider in every jar, a ham sandwich will never be the same again! Onion raisins chilli, mixed spice and mustard seeds plus sugar vinegar and salt are also included.